Each work day I find a new quote to write on the glass of my cubicle. I like to swap between inspirational and humorous so I don’t take each day too seriously. Over the course of the past month or so, some of my coworkers have stopped by to check what’s written and, when time permits, lend their thoughts on the topic. Last week, one of my wonderful coworkers shared the above quote with me and it’s since been branded on my brain. 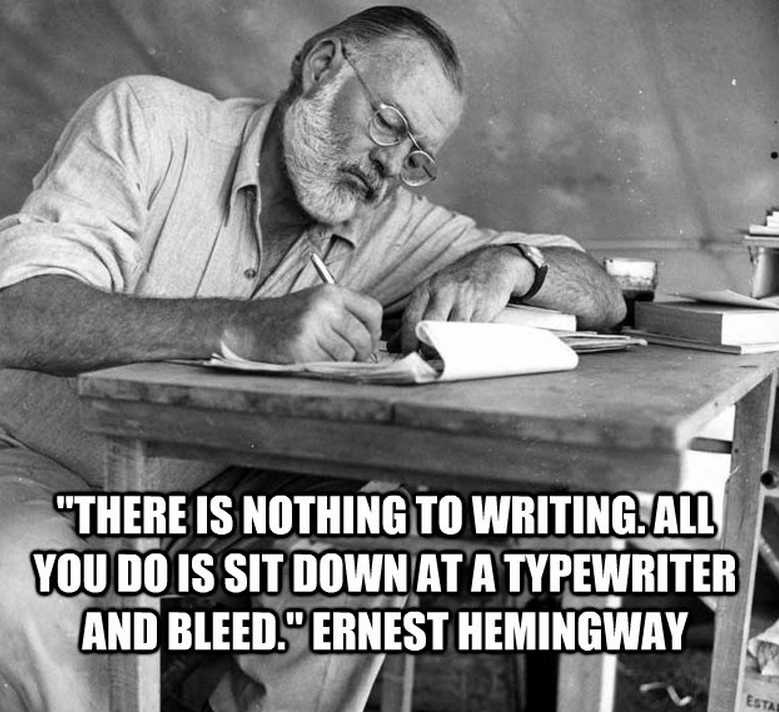 When I’ve written something that I was especially pleased with, it’s always because I’ve followed (without ever knowing at the time) this simple plan – sit down at the keyboard and bleed. I am so grateful for her 16 word gift. So is there a quote that has been branded on your brain? Share? That’s another great quote, Stacie. It’s also something that I’ve said in one form or another from the time I was either bartending or waiting tables. There have been far too many people that I’ve looked at but never seen. That point was hammered home late one night when I was driving from my apartment to my parents house. As I was driving through one of the tiny towns along the way, a cop pulled me over and, as expected, asked for my license. Imagine my surprise when he exclaimed, “Pete! You were our waiter at Circa (the dinner theatre where I Bootlegged).” I asked him which show he’d seen and gave an obligatory, “Oh, yeah, I remember.” I didn’t remember, but was thankful for that exchange because he simply informed me that I had a headlight out and didn’t give me a ticket. That got me thinking about how many people I merely “looked at” in that time. Just in the theatre, I would see on average 30 people x 5-6 nights x 52 weeks. If no one repeated in the year, that’s 7800 – 9360 people a year. I don’t know that I could estimate how many people I “looked at” while tending bar, but I think even a conservative estimate would push me over 12,000 people. So that’s where your Gmail status originated. So, what seemed unclear was whether Mike was a client or coworker. Those six words are simple yet profound, but even moreso if he was a client. Another of my internal conversations, I guess. 🙂 I wasn’t aware that I also did that while writing! Yes, Mike was a client at CLO. He was very high functioning and in fact lived in his own apartment and had a job at a local restaurant, but he still required a companion/supervision most hours of his day. I think that if a co-worker had said the same thing to me, I might have dismissed it as so much tripe. But the clients I worked with there were so utterly guileless in everything they did and said; the words stuck. Completely understandable and that’s what I assumed was the case. What a terrific gift! Here is one of my top favorite quotes, Pete. This quote is deeply special meaning to me… I feel my Heart swell and my eyes tear up every time I read or think about this one. “The strong, calm man is always Loved and revered. He is like a shade-giving tree in a thirsty land, or a sheltering rock in a storm. Who does not love a tranquil heart, a sweet-tempered, balanced life? It does not matter whether it rains or shines, or what changes come to those possessing these blessings, for they are always sweet, serene, and calm. That exquisite poise of character, which we call serenity is the last lesson of culture, the fruitage of the soul. It is precious as wisdom, more to be desired than gold – yea, than even fine gold. What a lovely quote. I would even go so far as to say “The strong, calm woman is always loved and revered.” I wouldn’t limit it to a specific gender when the sentiment speaks of someone who is ultimately comfortable in their own skin. I can honestly say it’s a perpetual struggle to find that balance that sheds the inconsequential and focuses more on those thoughts or tangible things that truly matter.